Try thinking about energy in 3 big categories. Your Home - including everything built-in, such as insulation, central A/C, heating, ducts, windows, etc. Most of these things cost a lot of money to change. Your Stuff - including everything you plug in such as dishwashers, refrigerators, entertainment systems, computers, lights, fans, electronics, washing machines, dryers, ovens, etc. If you check around you'll probably have a lot more stuff plugged in than you realize. And most -- but not all -- of the plugged-in stuff is using power, even when turned off. Some of these things are expensive to change... but many are not! Your Behavior - including how you use your home and your stuff. Do you program the A/C to be off while you're gone, or do you sometimes have the A/C on when windows are open? Do you turn off lights, or leave them on in unoccupied rooms? Do you have a smart strip on your entertainment system? 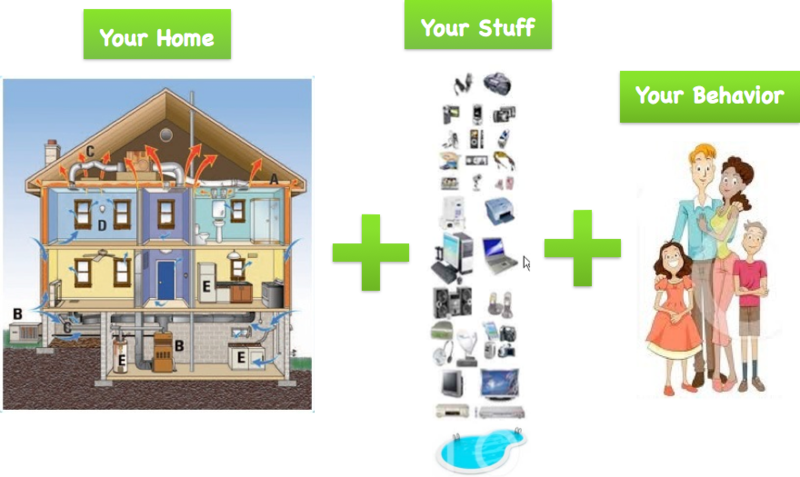 How you use your home and stuff can make a big difference in how much energy you're using. But how much of my bill goes to each? This is an analysis of a California home using smart meter data. The light blue and red are heating and cooling costs, which are primarily determined by local weather, the construction of the home, and the HVAC equipment. For this home it's less than 40% of the yearly bill. So even a major, costly renovation which might cut the heating and cooling use by 50%, would only reduce the yearly bill by 20%. On the other hand, the "stuff" and "behavior" categories account for over 60% of the yearly bill. And reducing waste in these categories is usually much less expensive. "Stuff" includes what we call the base and recurring loads. The green base load is all the stuff plugged in all the time, some of which is wasting power even when you think it's off. Examples: those four set top boxes plugged in around the home; that old refrigerator holding a few drinks in the garage; the idling computer; the game console; etc. The yellow recurring load is usually stuff on timers such as pool pumps, landscape lighting, etc... Given their cost, maybe these are running too long? The dark blue variable loads are the things you turn on and off all day: the dishwasher, clothes washer, dryer, lights, TVs, computers, etc. We help you pinpoint the wasteful "stuff" and "behavior" you could change to get the biggest drop in energy use for the smallest cost. In the chart above the different energy categories are shown throughout the year. Just as you'd expect, more heating is used in the winter months and cooling is used in the summer months. This chart is an example of the type of information we provide about your home's energy use. When you create an HEA energy profile you receive a private, secure account containing comprehensive, detailed energy use information and energy saving recommendations specific to your home. You'll also receive monthly energy reduction progress reports and energy reduction recommendations via email.